Who Sells window blinds in Sparta, NJ? All County Windows does, and you may be surprised that mixing and matching window blinds is a beautiful strategy. Today’s home decorating prints are not the old fashioned patterns that might first come to mind. Options include stripes, geometrics, florals, animal prints, abstract shapes and more, all updated to today’s color palettes and decorating styles. Prints can be bold and colorful or oh-so-subtle and neutral. It depends on what YOU like, and what looks good in YOUR home! Do mix and match patterns – within a few simple guidelines! It’s good to start with one print that has a relatively large pattern and use this for more than half of your printed materials in a room. Then as you mix patterns with additional home elements, use smaller scales and some of the same colors. This will ensure a harmonious look, rather than a sense of chaos. And do balance prints with solid color design elements in the same color range to settle your look. As with all window blinds design decisions, try to bring print samples home before you make your selections. Sometimes colors and patterns look different at home than in a showroom! If you’re nervous about adding prints to your home décor, experiment just a little with decorative throws, pillows, bedding and table linens. Prints are a great low-cost way to update the look of your home for just one season or for a lifetime! Add some energy and visual engagement to your home, with prints this season. Decorating with prints will add energy to your home decor. 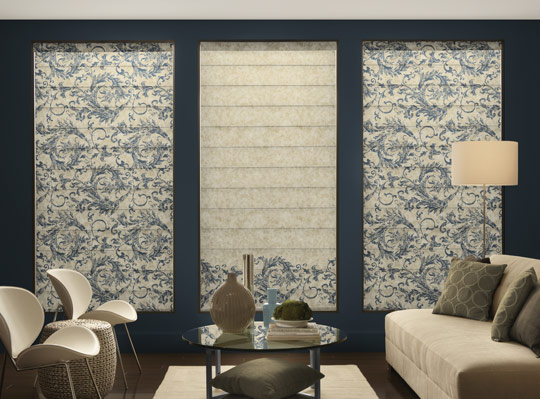 At All County Windows we carry a full line of shades and window blinds with patterns and prints on them. Simply give us a call and we will bring you sample books that you can choose from.